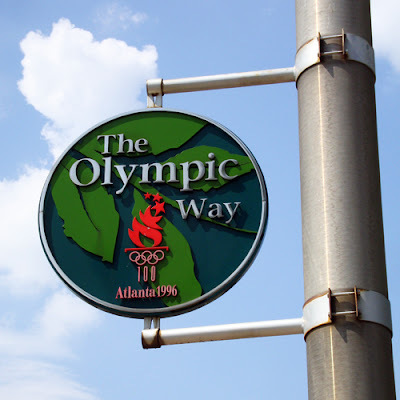 The Corporation for Olympic Development in Atlanta (CODA) undertook countless initiatives to improve the beautyscape of Atlanta immediately prior to the Centennial Olympic Games, including the streetscape known as "The Olympic Way." The 1.5 mile stretch from the Georgia State Capitol to Turner Field (the re-purposed 1996 Olympic stadium) offers handsome vistas of the Atlanta skyline and numerous other features...a nice drive, or walk, on any given day. I took a friend to the Capitol Avenue DMV (the Department of Motor Vehicles, for my non-U.S. readers) so he could renew his license. During the brief amount of time it took, I walked to Turner Field (making lots of photos along the way), and then back to the State Capitol Building. The excursion was a win-win.